In response to the letter to editor as submitted by Chauhan A et al., I put forth the various types of Waardenburg syndrome and their phenotypic variations along with the inheritance pattern and the diagnostic criteria for the most common type, Waardenburg syndrome type 1. [Table 1] shows the classification of Waardenburg syndrome (WS) (1–5 are the phenotypes). 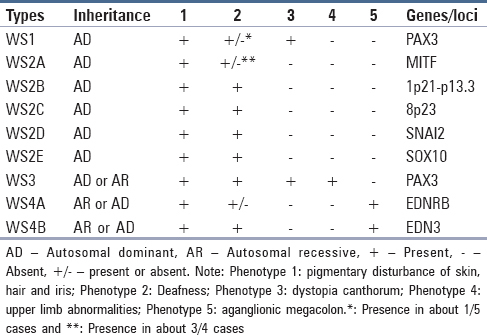 Note – Phenotype (1) Pigmentary disturbance of skin, hair, and iris; Phenotype (2) Deafness; Phenotype (3) Dystopia canthorum; Phenotype (4) Upper limb abnormalities; and Phenotype (5) Aganglionic megacolon. The asterisk indicates the presence in about 1/5 cases and the double asterisk indicates the presence in about 3/4 cases. Premature gray hair (age <30 years). The diagnosis of WS1 is established in a proband with two major criteria or one major plus two minor criteria as proposed by the Waardenburg Consortium (Farrer et al. 1992).